Above: vines in Volnay. Wherever we go, we see fruit still hanging on the vines. These are the product of a second flowering, or were simply deemed not worthy of picking. In any event, it's a field day for the birds and I have scarcely ever seen such clouds of starlings swirling above my head throughout the day as they work from vineyard to vineyard, uncaring as to whether their lunch is Premier or Grand Cru. Having been extremely benevolent, nature decided that fair's fair, we deserved a turn for the worse. The skies descended in the night and this morning saw grey cloud trapping humid air close to the ground, but adding no warmth. Today the diary was given over to Mike Stephens, an expatriate Mancunian who has lived in Beaune for 20 years, running his own negociant business for the last 17. Mike represents a number of interesting and high quality wine producers in Burgundy through his company Vins Divins and peddles their wares as far afield as the US and Japan. The US especially is a market that is growing exponentially and I asked him why. "It's what I call the Sideways effect", he replied. Since that film found such popularity, the Americans have seen merlot as very infra dig and have homed in on pinot noir. "There's not enough being produced in California, Oregon and Washington states to satisfy local demand, so they have started plundering Burgundy. Where else can you buy a decent pinot for €5?" Highlights of the day? One was to be found in white wine country, one red. The former was a visit to Michelot Mère et Fille. Véronique - the fille bit of the equation - and her husband fashion superb, pure, concentrated and complex chardonnays from appellations in Meursault and Puligny. The 2006s here are so bright, so suave, so sophisticated that tasting them is like being blinded by the refracted light being thrown out by some vast chandelier in Versailles. We offered the 2005s from here and had a chance to taste them again. I would be happy to send my notes to those who purchased these wines, so they can be happy too. The 2006s were virtually as scintillating and I will sell some, even if I have to threaten Mike with the brute squad to get an allocation. Véronique's had a shiny stud inserted into one of her front teeth, which gives one something slightly unusual to look at as one's tastes through her fine range. The red wine craving was more than satisfied by a visit to Didier Chevillon at the Domaine Dupont-Tisserandot. The more I taste the wines of this amicable, confident man, the more I am convinced that he is one of the great pinot masters. That such purity, such concentration of beauty, such excitement can come from the hands of one man is quite unfair on the rest of us. But hey, a single glass of one of his stunning wines will be enough to help us get over it. If you buy no other wine this year, get a case of Didier's Gevrey. How I can distil the day down to two highlights is utterly unreasonable, as there were a great many other superb wines, about more of which in the fullness of time. 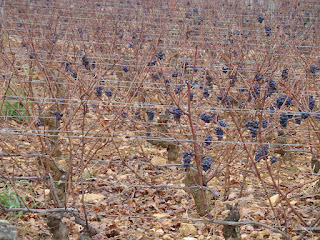 Wineries visited: Philippe Chavy; Michelot Mère et Fille; Joseph Voillot; Domaine Jouan; Dupont-Tisserandot; Domaine Sigaut.